Thomas Cowan was born in 1895, and attended George Heriot’s School from 1904-1910. He worked as a Reporter on the Staff of the Edinburgh Evening News. He was a private in the 15th Royal Scots, September 1914; a Signaller in France, January 1916. He was severely wounded on 1st July 1916; missing and believed to have died on that date. 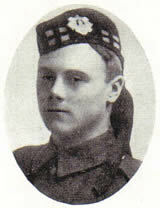 He was the son of Thomas Fairbairn Cowan and Margaret Drysdale Russell Cowan, of 23, Shandon Crescent, Edinburgh. He died at age 20 and his name is on the St Michael’s WW1 memorial.